This nineteen story anthology is edited by one of Baen’s best, Hank Davis. Though the book is pretty new, the stories range from as early as the Thirties all the way to now. So I think it qualifies as a Friday Forgotten Book for it’s contents. For the most part, this is the kind of science fiction I grew up on and still love. These are what is now – with the exception of two of the newest stories – thought of as “old fashioned” hard SF. Davis provides brief editorial comments before each story. I particularly enjoyed the Pournelle and Simak. Thoroughly enjoyable. This sounds very good, Rick. When I first read science fiction in my early twenties, I read a lot of science fiction stories, lately I have stuck to novels. The authors I remember reading were by Theodore Sturgeon and Robert Silverberg. Most of these are oldies but goodies, Tracy. I’ve read all but five of the stories here, Rick. Great stuff! Davis has a knack for putting together solid anthologies. Yes he does, I have several of them. Nice group of authors and stories. Former DAPA-EM member Davis has put together many good Baen anthologies. Agree. I remember when I joined DAPA he sent me a very welcoming email and a couple of paperbacks. Nice guy. I have SPACE PIONEERS and like Jerry I’ve read a number of the stories included. Jeff is right about Hank Davis and his ability to assemble enjoyable anthologies. Yes, and this is a good one. A pretty good book. My favorites being the Simak and Sturgeon. 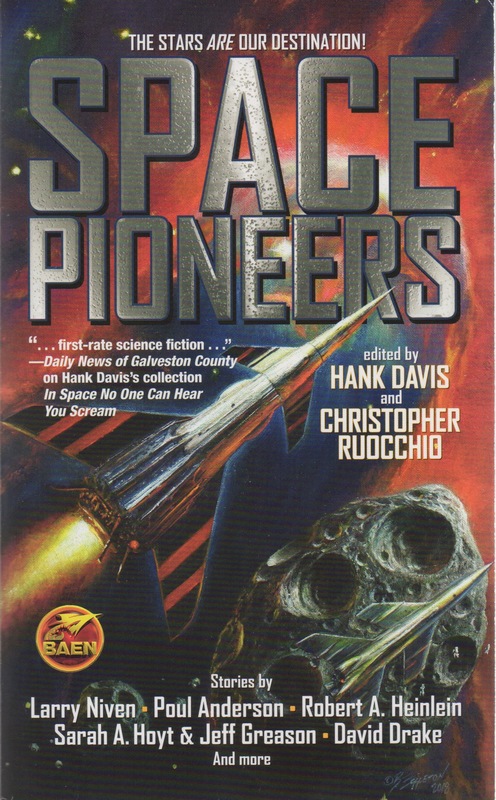 Davis tends to stay away from the Baen regulars who populate other anthologies from Baen. Most of whom are too right wing for me. And are lousy writers besides.